The Mars Society is pleased to announce a new mission, Mars 160, using both of the organization’s analog research stations. 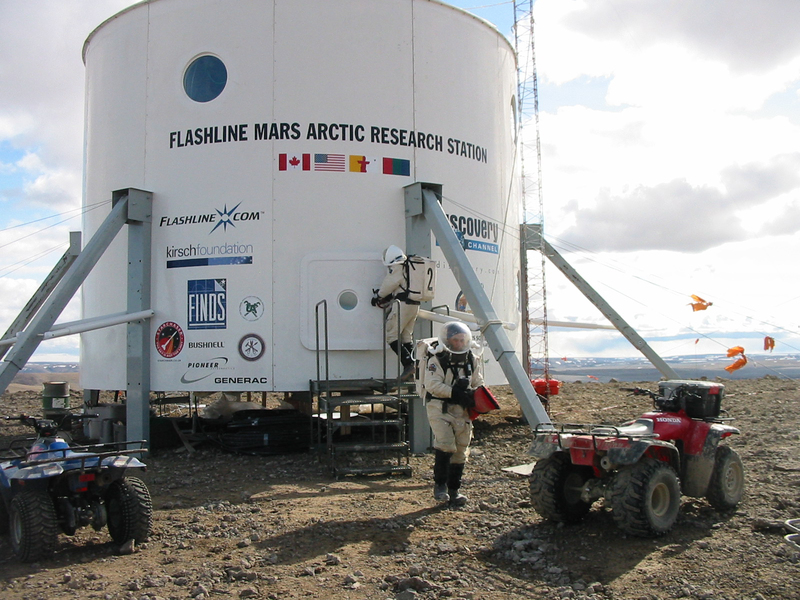 This program will involve the same seven person crew doing similar science operations for the same period of time – 80 days – initially at the Mars Desert Research Station (MDRS) in southern Utah in the fall of 2016 and then continuing at the Flashline Mars Arctic Research Station (FMARS) in northern Canada in the summer of 2017. Ms. Rupert will serve as the mission’s Principal Investigator, while Dr. Robert Zubrin, President of the Mars Society, will operate as Program Manager. During the course of two 12 week missions, the crew will conduct a sustained program of geological, paleontological and micro-biological field exploration while operating under many of the same constraints that human explorers on the Red Planet would face. The team will also carry out Mars-relevant engineering research, testing biomedical tele-science, spacesuit technologies, EVA traverse strategies, astronaut cross-training in the field and habitat technologies. By so doing, they will help advance humanity’s knowledge of how to explore on the Martian surface. Furthermore, by conducting the Mars 160 mission in the form of twin studies, dubbed Mars Desert 80 (MD80) and Mars Arctic 80 (MA80) with the same crew operating in the Arctic and the desert, the program will provide important information as to how well Mars analog missions held in the desert can serve in place of far more expensive Mars surface simulations carried out in the Arctic, and to what extent conclusions drawn from desert-based research need to be adjusted to reflect that which would likely be obtained under more stressful Arctic field conditions. The Mars 160 mission is expected to greatly improve the cost-effectiveness of Mars analog research. The Mars 160 crew was selected from veterans of the MDRS program, with most members coming via the selection process that was set up for the Mars Society’s planned Mars Arctic 365 mission (MA365), which is still waiting necessary funding. Mars 160 will help advance the prospects for MA365 by testing the candidate crew for a substantial fraction of the planned MA365 duration, as well as by potentially reducing its cost through exploring the likelihood of more economical desert field work to replace part or all of the long-duration Arctic mission. In the course of their mission, the Mars 160 crew will post regular reports and blogs available to the public in English, French, Russian and Japanese, allowing people from around the world to follow their expeditions. The MD80 portion of the Mars 160 mission is scheduled to begin at MDRS on September 24, 2016, coinciding with the 19th Annual International Mars Society Convention, which will be held September 22-25. Just before commencing the mission, the crew will hold a Skype telecom with the convention, allowing those in attendance to meet and talk to them before the simulation begins. For continuing updates about Mars 160 mission planning, please visit our web site or Facebook page.